Powell doesn't have a huge upside as a running back but I would be surprised if he didn't end up having a productive career. Positives: Has good size and strength. Runs hard. Has pretty good burst to hit the hole. Shows pretty good vision as a runner and has good feet. He runs with good pad level and balance which makes him hard to tackle at times as he has strong legs and consistently drives them for extra yardage after contact. He shows that he can catch the ball out of the flat and likes to initiate contact when he gets outside or when he gets to the second level. He can run you over and attack you in the open field or he can use some of his shiftiness to make you miss in the flat. Negatives: Powell isn’t a very explosive back and he won’t be ripping off huge runs consistently in the NFL because of his lack of shiftiness as a runner and he doesn’t have great straight line speed. He doesn’t run well when he is forced outside of the tackles and doesn’t have the speed to get the corner consistently in the NFL. Doesn’t offer much as a pass blocker in the backfield. Overall: Powell can be a quality feature back in the right offense. He runs with good power and shows pretty good burst and vision which makes him a pretty good running back prospect. He won’t ever be an elite runner because of his lack of great straight line speed and he isn’t that well rounded yet but I would be surprised if he didn’t end up being a pretty productive NFL running back. Projection: 4th round. I think this is where Powell will start to get some consideration, especially for teams that run offenses that need more powerful runners. Burke may not have a lot of playing experience, but I think I saw enough from him that I think he can stick in the NFL as a back-up. Positives: Has solid size, arm strength and accuracy and displayed this in limited time this season when Adam Froman was not in the line-up. He also displayed pretty good mobility to extend plays and occasionally pick up yardage with his legs. In the games I saw him in he started slow but improved over the course of the game, and I think he could stand to get more experience obviously. His mechanics are solid as is his footwork and he played in an offense with some pro-style ties at Louisville, and the offense has a strong focus on the running game because of Bilal Powell’s emergence. In the small sample of time that I got to see him I was impressed, especially since I expected to see Froman in Louisville’s bowl game and instead Burke was the starter. Negatives: He definitely doesn’t have a lot of starting experience and the tape that he has accumulated isn’t very substantial, I didn’t have a lot of chances to watch him because Froman was the starter and he only filled in for him some this season. He doesn’t have any elite tools and obviously wasn’t good enough in the eyes of the coaching staff to be the starter outright at the beginning of the year, so I was kind of surprised to see how well he played considering the circumstances. He doesn’t have a very high ceiling despite his lack of experience, so his limited experience doesn’t make him a very intriguing talent in spite of the detriment it has on a player’s draft stock. Overall: I think Burke has the potential to be picked very late or signed as an undrafted free agent where he would compete to be a practice squad player and perhaps a #3 eventually. He’s a bit raw because of his limited experience but I think with coaching he could stick on a NFL roster, I saw enough from him in the limited snaps I was able to watch him in. I was particularly impressed with how he played in the bowl game, especially because I don’t think he was projected to be the starter. At least I wasn’t aware that he was going to play. So theoretically he played on late notice and still played well, and that indicates some mental toughness if that is the case. I just have a feeling that he will be able to stick in the NFL as a back-up. Maybe I’m wrong, and I don’t think he will be a starter, but that is what my gut is telling me. So hopefully he gets his shot. Projection: 7th round/Undrafted. I would consider him late in the draft in the 7th round range but I would not be surprised if he went undrafted, especially because he is about as under the radar as you can be at a school in a major conference. Hi everyone, sorry my posts have been a bit infrequent lately. I am currently in Mexico on vacation with my family and I don’t have internet in the house I am staying at. I didn’t bring my phone with me either, so in a way it is nice to get away from it all for a while. However, I watched the Sugar Bowl at a restaurant that had a TV and paid attention to some specific players and also noticed some who performed well. So despite not having internet where I am staying here are my notes on Arkansas and Ohio State from the Sugar Bowl! Ryan Mallett, QB, Arkansas– Mallett had a bit of a tough night. He had his ups and downs and his receivers dropped at least five catchable balls, some of them which would have been big plays, but he had his share of very inaccurate throws himself. He was routinely pressured, so credit Ohio State’s defensive line and blitz packages for that, but he did not do a good job of finding hot reads and getting the ball out quickly in this game. He held onto the ball too long and eventually had to take a sack or throw an off balance pass that was either somewhat catchable or in the dirt. He has a pretty good sense of when to move up in the pocket when the pressure is getting there, but once the pressure forces him out of the pocket he was not accurate in this game. He had no interceptions all season when throwing outside of the pocket until this game when he threw his only interception of the night late in the fourth quarter after being forced outside the pocket yet again. He had a number of impressive throws in this game though, particularly on fade routes. He showed nice touch, good arm strength and impressive accuracy to put the ball on the right shoulder and where only his receiver could make a play on it a number of times on fade routes. However, he had a few bad decisions too like he always does. He isn’t afraid to throw into double coverage and even without his feet set he is sure he can throw the ball pretty much wherever he wants, which isn’t always the case. His footwork still leaves a lot to be desired for this reason, because when he sets his feet he can put the ball wherever he wants it thanks to his terrific arm strength and good (but inconsistent) accuracy. Like Jay Cutler, when he is on he is really on, and can sling the ball all over the field. But he was noticeably frustrated against Ohio State because his receivers dropped some passes they really should have caught, and it culminated with Mallett forcing a pass into coverage and getting picked off by a defensive end dropping into coverage. Suffice it to say, I’m still not a Ryan Mallett fan. I think his ceiling in the NFL is a Jay Cutler type of QB who can really sling it when he is having a good day, but unless he improves his footwork he will always be inconsistent from game to game and season to season. However, Mallett’s floor is also a low one in my opinion, because I have no idea what kind of character he possesses and I have heard there are a number of scouts and GM’s who have significant enough problems with his character to not have him on their draft board at all. If these rumors are true and Mallett turns out to have character issues (not because of off-field incidents, but more like Jimmy Clausen’s character issues about being too cocky/arrogant, etc.) then I think it will hurt him on draft day like it did Clausen. I’m still unimpressed with Mallett as a leader and as a “clutch” player late in games because I still don’t think I have seen him get the ball late in a game and methodically drive his team down the field for a late touchdown or field goal to take the lead. The announcers mentioned a three play, 73 yard touchdown drive before the punt block occurred, but that is a misleading statistic. The first two throws on that drive were pretty easy throws to open receivers, and the third throw, while impressively placed between the cornerback and the safety down the sideline, was caught by Greg Childs who made the safety miss and then was clear to jog into the end zone for the final 30+ yards of the drive to take the lead. Not exactly a magical drive from Mallett I wouldn’t say. Anyways, I was wondering if he had it in him to make a couple of good decisions and throws in this game to win it late (even though they got really lucky with the short field from the punt block) but a dropped pass and then an off balance throw that was easily intercepted by a defensive end took care of that threat. 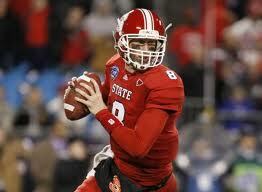 Because Mallett is not a proven “winner” in my opinion I don’t see him developing into one once he gets to the NFL. 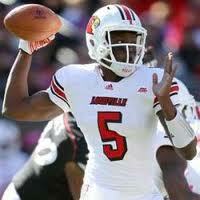 There are too many things going against him: Poor footwork, inconsistent accuracy/ball placement, inconsistent decision making, potential character concerns, little experience leading come-backs late in the 4th quarter and significant evidence to say that he is a “System Quarterback” given the fact that none of the QB’s Petrino has coached in his system have gone on to have NFL success. I said earlier this year that I thought Knile Davis was the best prospect on Arkansas’ offense and I still feel that way. It will be interesting to see how the draft process unfolds for Mallett, and even though I’m not a fan I would feel like a jerk if I didn’t wish him good luck the rest of the way. Honestly, he may need it. Terrelle Pryor, QB, Ohio State– I have probably not hidden the fact that I am not a Terrelle Pryor fan either, so I have to start this post off by saying that even though he had a great statistical performance in this game I am still not a fan at all. He had a ton of production in this game, and like he usually does he converted some huge first downs for Ohio State with his legs and I believe he ended up with well over 100 yards rushing, which is impressive considering Arkansas’ ability to create sacks and negative plays (for those who don’t know, in college when the quarterback is sacked the yards lost are considered a negative rushing play and taken out of their rushing total. That is why some pocket passers will end games with negative yards rushing even though they rarely, if ever, crossed the line of scrimmage). 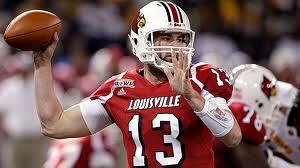 He even looked pretty good as a passer in the first half. I was surprised how well he handled some of Arkansas’ pressure, but I can’t say I have a lot of faith in their secondary so it’s not a surprise that some of his receivers were getting separation. I’m still not sold on him as a passer, but he got the ball out under duress better than I thought he would. Like last year in the Rose Bowl he impressed me by saving his best performances for big games, so you have to give him credit for that. I may not be sold on him as a NFL QB, but I will always like players who despite all the things that may happen leading up to a game (such as getting suspended for the first five games of your senior season for selling old memorabilia from your career) can still put on a show when it counts. That’s not to say he locked this game up with his arm, he was really ineffective in the second half, probably because Arkansas started to mix in more zone instead of pressuring him. Scrambling QB’s are tricky to prepare for because sometimes if you blitz them and you get to them you can force turnovers, but if they can escape pressure (like Pryor was able to for the entire first half and even in the second half) then there will usually be a lot of room to run or a wide open receiver as a result of a broken play. Mike Vick was great at escaping from pressure (especially against average or worse defenses), as is Pryor, and at picking up first downs because of his legs. Despite some of the impressive throws Pryor had in this game I am still not sold on him as a passer. When it was crunch time he converted with his legs, not his arm, and he didn’t seem comfortable reading zone coverage and had to exit the pocket and scramble to buy more time so one of his receivers could come open. I’m not sure how good his anticipation is as a QB, and because I watched this live I won’t be able to evaluate it until I re-watch it later, but it seems to me he wouldn’t have struggled to find receivers to throw to against Arkansas’ more zone-heavy scheme in the 2nd half if he could anticipate where his receiver would be and throw him open in the hole in the zone. Because he wasn’t able to do that he had to extend plays with his legs and I can think of probably three or four horrible throws that were off his back foot with tons of air under them that he had to thank God that they went out of bounds. He had a couple of potential interceptions dropped by the Arkansas’ secondary additionally, and at least one of them was an absolute “gimme” where two defenders went for it and neither came away with it. So, while Pryor played well overall and had a very productive game with what was probably about 350 yards of total offense by himself I am still not sold on him as a NFL QB. He is a great athlete and he has good arm strength but very inconsistent accuracy. He just isn’t a very good passer from the pocket when it comes down to it. His pocket presence is not very good because his tendency is always to run or scramble when pressure comes instead of stepping up into the pocket, keeping his feet set and throwing his receiver open. He seemed to struggle reading zone coverage, I’m not sure how well he does finding his hot reads and I still don’t trust his decision making. So while he had a great game and got Ohio State (and the Big 10) a much needed BCS win against an SEC team he still hasn’t impressed me as a passer. For his sake I hope he comes back next year and serves his suspension just on the off chance he develops some more. 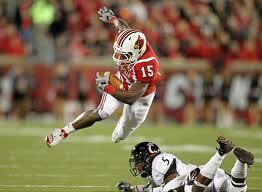 Knile Davis, RB, Arkansas– I am a huge fan of Knile Davis. He had a good game against Ohio State even though he had a costly fumble in the 2nd half. He was fighting for extra yards and even though he had the ball tucked away safely in one arm he should have covered it up with two to make sure it didn’t get stripped. I believe Arkansas recovered it anyway, but still it was a mistake on his part. Other than that I thought he played great. He showed impressive burst, acceleration and pretty good vision all game. He tried to bounce one or two runs outside (that I can remember from just watching it live) that I didn’t think he should have but mostly he was good at getting North and South from what I remember. He had another 100 yard game, his sixth of the season even though I believe he only started nine games all year. He really helped take Arkansas from a dangerous passing offense to a juggernaut balanced offense this year with his emergence, and though Mallett had a huge hand in making big plays in the passing game a lot of it was set up by Davis forcing teams to creep up and respect the run. If Mallett leaves as I expect him to I am really excited to see if Davis can have a huge season next year even though Tyler Wilson will be stepping in at QB. Wilson showed some flashes of what he can do in Petrino’s offense against Auburn with a 400 yard, four touchdown performance in a loss but I think it’s clear that even though Mallett is extremely physically talented a player with less physical gifts like Wilson (who actually showed some pretty nice zip on his passes in that game from what I remember) can still operate the offense and make it explosive. So congratulations to Knile Davis on a fantastic season and I really hope he has a great junior season and that he stays healthy so he can end up being picked in the 1st round next year. The SEC should have a ton of talented RB’s to watch next year by the way: Knile Davis at Arkansas, Marcus Lattimore and Kenny Miles at South Carolina, Trent Richardson at Alabama (assuming Ingram leaves), Brandon Bolden at Mississippi, Vick Ballard at Mississippi State, Tauren Poole at Tennessee, and Washaun Ealey at Georgia. It should be fun to watch as some of those programs start to feature those running backs a lot, especially now that the conference has some young, promising talent at QB. Joe Adams, WR, Arkansas– Adams had a huge game statistically but it could have been even bigger if he didn’t drop three catchable passes. I love his speed in the slot so that he can turn a short drag route into a twenty yard gain and his speed to challenge down the seam or down the sideline vertically. Plus he is elusive after the catch and plays with a feisty attitude which I like. However, his hands just aren’t quite what you want in a wide receiver yet. The first deep shot of the game was to Adams and it bounced right off his hands which really set the tone for Arkansas in the first half. The whole time the announcers talked about how Ohio State has been good at preventing the big play all season which is why they don’t give up a lot of yards but they had an early opportunity to make a big play and get some momentum but Adams let it bounce right off his hands. He dropped two other passes that I can remember, one that would have been for a touchdown, and that really hurts his grade for his overall performance in this game. If he didn’t have those three costly drops I would have said he is exactly what the Falcons needed at wide receiver because of his ability to stretch the field, make guys miss for yards after the catch and because of his tendency for explosive plays. However, I think he should go back to school, work on his hands all summer and hopefully he will come back with Tyler Wilson to form a new big three of Wilson, Davis and Adams now that Mallett and Childs should both be gone. This kid has a ton of potential but as stupid as it sounds for a wide receiver, he just has to improve his hands. He has the speed and burst to improve as a route runner (I’m not sure how good he is at this point) and that can be coached up, but if he wants to improve his hands that is on him. There are plenty of examples of receivers who didn’t have great hands who came into the NFL and improved them over their first three seasons, and if Adams wants to be one of those guys all he needs is the work ethic. However, there are even more guys who had tons of potential because of their speed and play-making ability in college who never capitalized on it in the NFL because their hands held them back. I really hope Adams doesn’t end up being the latter. DeMarcus Love, OT, Arkansas– Love had a tough game. I can honestly say I didn’t pay too much attention to him because I was trying to see how Mallett, Davis, Adams and D.J. Williams were doing but when I did notice him it was usually bad news. He had a lot of trouble with Cameron Heyward and that isn’t surprising, I think Heyward is a top 20 lock, and probably the #2 3-4 DE prospect after Marcell Dareus in this entire draft. His strength and power gave Love a lot of issues, and routinely Love got beaten by Heyward which led to pressure on Mallett before the play could really develop. That’s not good for Love’s draft prospects because I’m not sure he has the lateral agility and athletic ability to stick at left tackle, but at right tackle teams are going to be looking for a guy who can be a road-grader in the running game and take away whatever pass rushers they are up against, unless of course they have to face a guy with good/great speed off the edge. I will have to re-watch this game closely to see how Love does, but depending on his athletic ability and how well he gets to the second level I have a feeling his NFL future may be inside at guard. But like I said, I need to re-watch this game before I come to any conclusions about Love as a prospect. I just noticed that he struggled mightily at times in this game. D.J. Williams, TE, Arkansas– I like D.J. Williams as a prospect, and I think he has developed into a solid blocker. I don’t know that he will ever be a great blocker but being able to be solid blocker will really help his value as a prospect, because without that ability he would be a horrible fit in an offense that asks their TE’s to block a lot like Atlanta’s. Now he is a potential fit because of that ability, and he seems to have a good work ethic so there is reason to hope that he could improve with coaching. His real value comes as a receiver though. 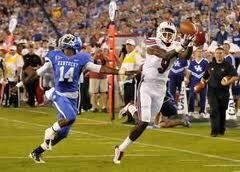 I have heard him be compared to Tony Gonzalez which is a comparison I don’t like at all, but he is a good receiver. His hands are pretty good even though it was his drop that preceded Ryan Mallett’s game ending interception for Arkansas. I see him let passes into his pads at times though which is a bad habit, but he has good hands overall in my opinion. I’m not sure how much he will be able to challenge down the seam in the NFL because I don’t really buy that he has 4.6 timed speed, but he is good at finding holes in the zone and he catches the ball effectively in traffic. He is also very hard to bring down after the catch, and he routinely picks up extra yardage not with speed and great elusiveness but by lowering his shoulder and running through tacklers. I personally think Lance Kendricks is a better TE prospect but that probably has something to do with me seeing a lot of him over the past three years, and I think that if Rudolph declares he will still get picked before Kendricks and Williams. I would be surprised if those two were not the next TE’s off the board barring additional junior declarations. Cameron Heyward, DE, Ohio State– I am a big Heyward fan and I really think he should be off the board in the top 20 selections. He is the perfect 3-4 DE in my opinion and if a team in the top 20 needs one he should be high on their wish list. He has great size, he’s really strong and he has great hand usage to shed blocks. I’m not sure he has the best motor, but he stands up well at the point of attack versus the run and is quick enough that he can penetrate into the backfield with one move and close on the ball carrier. He seems to be a pretty good tackler, though I haven’t scouted him enough to be sure of that. However, when it comes to the basics of playing DE in a 3-4, he has them down. He is strong enough at the point of attack to control two gaps, he is very good at shedding blocks because of his strong and active hands, he is at least a solid tackler and he has good quickness for his size to penetrate and make plays in the backfield when given the opportunity. And if that 3-4 team goes into a nickel defense and has four down lineman he can play LE or DT depending on whether it is a running or passing situation, potentially making him even more valuable. I just think he is a very well-rounded player and he had a great game against Arkansas. He was pretty much a one man wrecking crew and he could not be blocked with just one guy, regardless of whether he was playing outside at DE or inside at DT. Like I said before, I like players that show up big in big games and Heyward certainly did that against Arkansas. He was constantly pressuring Mallett, penetrating versus the run and generally wreaking havoc whenever he was in. And perhaps even more impressive was the fact that it was extremely noticeable when he came out because of his elbow that was bothering him. Arkansas moved the ball much better as soon as he came out, and when he came back in his impact was immediately felt. It is rare for a defensive lineman to have that kind of impact on a game, but Heyward did and it really impressed me. If I was a big fan before I am an even bigger fan now. I’m not sure he will test all that well as far as 40 time and what not, but he has great size, good short area quickness and he is really strong, so even if he doesn’t run the fastest 40 for a guy his size he shouldn’t be docked too much for it. I look forward to seeing him at the Senior Bowl if he does indeed go. I imagine it will be more of the same of him dominating blockers one on one for the most part if he does. Thanks for reading, hopefully you can watch and enjoy the remaining bowl games! I will do what I can to put up predictions for the Cotton Bowl and the National Championship game, but internet access is infrequent for me. That is why I wasn’t able to put a prediction post up for the Sugar Bowl. For the record I did predict their comeback in the second half, just ask my Mom (who watched the game with me and lost a 50 cent bet about Arkansas’ potential comeback).